Arriving at Gwingris I decided to rest up for a week or so and enjoy the hospitality of the handful of elves that call this place home. I've been adventuring hard in the past months and it was starting to take it's toll. My armour and weapons were in need of repair, as was my aching shield arm. The days were growing ever shorter but I was thankful for the last few days of summer sunshine. I knew the road ahead lay under the mountains and who knows when I would feel the warmth of the sun on my skin again. I would need to be at my best for the journey to the Hollin Gate and then on into Khazad-dûm, the Mines of Moria. 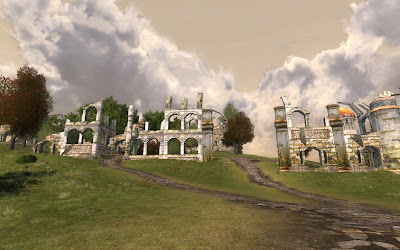 Eregion or Hollin in the tongue of Men was a kingdom of the Noldorin Elves in Eriador during the Second Age, located near the West Gate of Khazad-dûm under the shadow of the Misty Mountains. The Elves of Eregion lived in harmony with a Dwarven civilization, trading freely with the Dwarven kingdom of Khazad-dûm, or Hadhodrond in the Elven tongue. 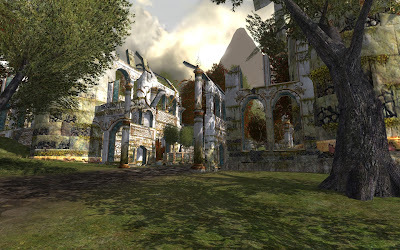 In the Third Age, Eregion now is a pleasant but unpopulated land, and contains many of the ruins of the Elven civilization that once thrived there. It is famous for its holly trees, whence the name in both (translated) Westron and Sindarin came from. Cooks will also find a bounty of abundant produce growing wild in the region.